The announcement of an eruption in the Smithsonian/USGS Weekly Volcanic Activity Report (30 July-5 August 2008) was later found to be false. The Darwin Volcanic Ash Advisory Center (VAAC) noted that a pilot reported an eruption plume from Sumbing on 1 August 2008. The plume allegedly rose to an altitude of 4.9 km and drifted W. However, ash was not identified on satellite imagery. Center of Volcanology and Geological Hazard Mitigation (CVGHM) observers at the local observatory saw only non-eruptive processes at the volcano, and they noted brush fires in September and October. A common problem in this active region occurs when drifting plumes become linked to the wrong volcano. After discussing the field observations, both Darwin VAAC and Indonesia's CVGHM concluded the report was in error. No thermal anomalies have been detected by the MODIS/MODVOLC satellite system for the volcano since 5 October 2006. The area of Mt. Sumbing, close to Mt. Sundoro (also known as Sindoro) on Java (figure 1), was the subject of a recent study of people's perceptions and reactions to volcanic hazards (Lavignea and others, 2008). Note that there is another stratovolcano named Sumbing on Sumatra. In addition, one of the domes of Kelut (Java) is known as Sumbing. Figure 1. Area around the twin active volcanoes of Sumbing and Sundoro. Note the nearby volcanological observatory at Gentingsari. The circles around the volcano summits represent radii of ~4 and 6 km from the summit. From Lavignea and others (2008). Reference. Lavignea, F., De Costerb, B., Juvinb, N., Flohicb, F., Gaillardc, J-C., Texierd, P., Morine, J., and Sartohadif, J., 2008, People's behaviour in the face of volcanic hazards: Perspectives from Javanese communities, Indonesia: Journal of Volcanology and Geothermal Research, v. 172 (3-4), p. 273-287. Information Contacts: Darwin Volcanic Ash Advisory Centre (VAAC), Bureau of Meteorology, Northern Territory Regional Office, PO Box 40050, Casuarina, NT 0811, Australia (URL: http://www.bom.gov.au/info/vaac/); Center of Volcanology and Geological Hazard Mitigation (CVGHM), Saut Simatupang, 57, Bandung 40122, Indonesia (URL: http://vsi.esdm.go.id/). Gunung Sumbing is a prominent 3371-m-high stratovolcano that lies across a 1400-m-high saddle from symmetrical Sundoro volcano in central Java. Prominent cones are located on the N and SE flanks, which is somewhat more dissected than Sundoro. An 800-m-wide horseshoe-shaped summit crater breached to the NE is partially filled by a lava dome that fed a lava flow down to 2400 m elevation. Emplacement of the dome followed the eruption of extensive pyroclastic flows down the NE flank. The only report of historical activity, in about 1730 CE, may have produced the small phreatic craters found at the summit. Sukhyar R, 1989. Geochemistry and petrogenesis of arc rocks from Dieng, Sundoro and Sumbing volcanic complexes, central Java, Indonesia. Unpublished PhD thesis, Monash University, 319 p.
Taverne N J M, 1926. Vulkanstudien op Java. Vulk Meded, 7: 1-132. There is no Deformation History data available for Sumbing. There is no Emissions History data available for Sumbing. 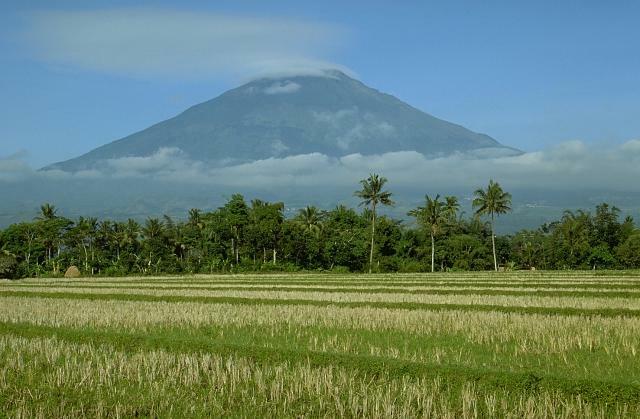 The prominent stratovolcano Sumbing rises above rice fields to 3371 m immediately to the SE of Sundoro volcano. An 800-m-wide crater at the summit is breached to the NE, and flank cones are located on the north and SW sides. 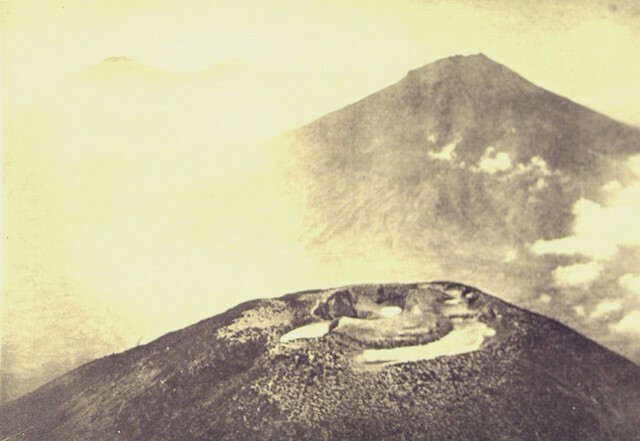 The only report of historical activity from Sumbing volcano was a phreatic explosion from the summit crater in 1730. Photo by Lee Siebert, 1995 (Smithsonian Institution). Gunung Sumbing is seen here from the NNW, east of the saddle separating it from Sundoro volcano. 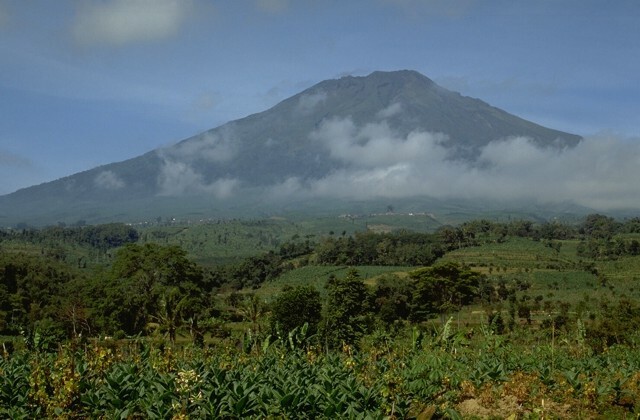 Both conical stratovolcanoes rise above 3000 m. Sumbing volcano has been less active during historical time than Sundoro. 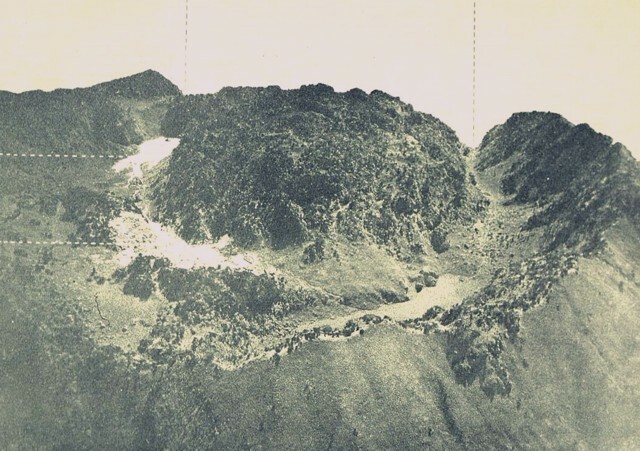 During one of the more recent eruptions of Sumbing volcano, a lava dome was emplaced in the summit crater and a lava flow traveled down the NE flank. An aerial view from the NW looks across the summit crater complex of Gunung Sundoro volcano to Gunung Sumbing. These imposing 3000-m-high conical stratovolcanoes form prominent landmarks between the Dieng volcanic complex and the city of Yogjakarta. Both volcanoes have erupted in historical time. Photo published in Taverne, 1926 "Vulkaanstudien op Java," (courtesy of Volcanological Survey of Indonesia). A blocky lava dome fills the summit crater of Gunung Sumbing volcano. This view from the south shows the breached NE crater rim, through which a lava flow descended. The upper light-colored area on the left is a small pond, and the lower is a fumarolic area. There are no samples for Sumbing in the Smithsonian's NMNH Department of Mineral Sciences Rock and Ore collection. Large Eruptions of Sumbing Information about large Quaternary eruptions (VEI >= 4) is cataloged in the Large Magnitude Explosive Volcanic Eruptions (LaMEVE) database of the Volcano Global Risk Identification and Analysis Project (VOGRIPA).